Trainers, for the second year in a row, Niantic has announced their annual Earth Day campaign! Just like last year, Niantic teams up with Playmob to encourage players to participate in cleanup events all around the world. Earth Day 2019 events will take place from April 13 – 28. Together with 15 NGOs (nonprofits) from around the world, Niantic invites players and community members to join them in various local events across the globe. These events include cleanups to remove trash at natural and public spots, and also long term impact projects to save local ecosystems and wildlife. As a reward to the player base and the participating communities for their efforts, in-game bonuses will be awarded globally for both Ingress (Niantic’s other AR game) and Pokémon GO. However, specific goals will need to be achieved. You can find all rewards again in this awesome sharable infographic by Orange Heart! In-game rewards will be released within a 48-hour window from the end of the Earth Day Campaign. According to the Pokémon GO Newsletter, Earth Day 2019 rewards will run from April 29th through May 2nd 2019. Niantic aims to shatter last years results by increasing the thresholds of the rewards, so do your best Trainers! If 5000 players attend these events, a new shiny will be released! Shiny Diglett can be recognized by its slightly pale color and blue nose. Differences can be seen in the table below. Earth Day is an annual event celebrated on April 22. Since 1970, various events are held worldwide to demonstrate support for environmental protection. With over 1 billion people taking part it is the largest civic observance in the world. “Playmob is a games for good company, underpinned by values-driven data. We connect global brands and NGOs to millions of highly engaged gamers to make the world a better place through play.” For more info, visit the official website. Interested in participating in one of the events? That’s great Trainer! You can find an event in your neighborhood on the official Earth Day Cleanup website. If you know an NGO that could help organize a cleanup, Niantic encourages you to submit them! While we all love the world of Pokémon, let’s not forget our own world. Show some love for our planet, and make it a better place. Every small step works toward a big and better future! Stay safe, and happy exploring. 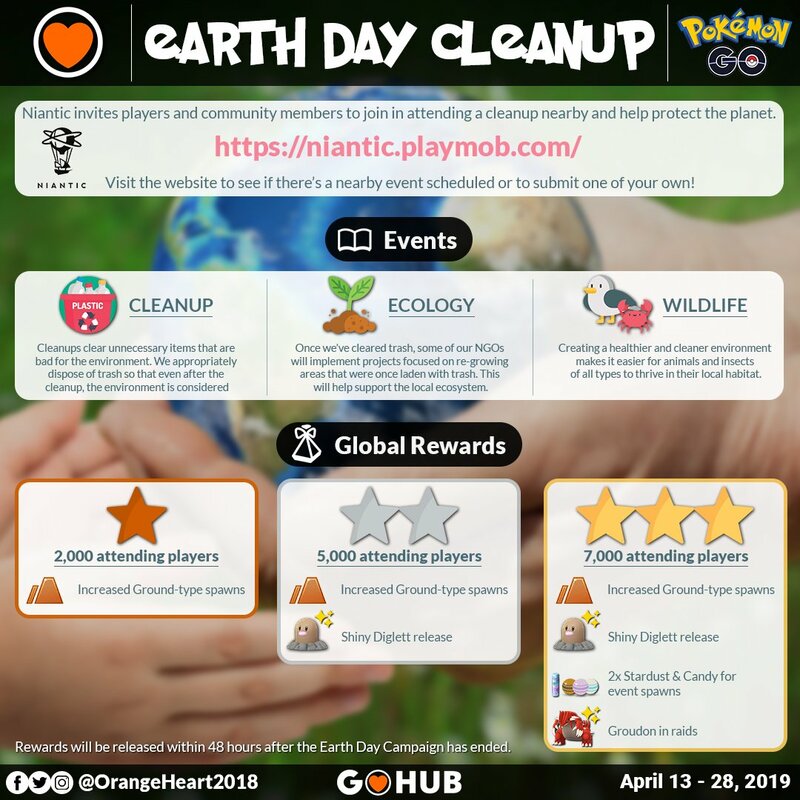 The post Earth Day 2019: Niantic Teams Up for Global Cleanup appeared first on Pokemon GO Hub.